While this isn't exactly made by Apple, it is made with apples. 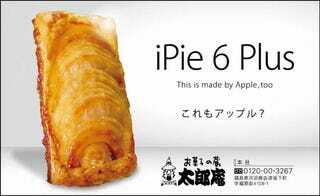 Sweets shop Taroan, located in the Japanese town of Aizubange, recently introduced its latest desert, the iPie 6 Plus. As reported on J-Town, even the ads were tongue-in-cheek, as was the in-store display. Here is what the iPie 6 Plus looks like. It is apparently "surprisingly delicious." I bet it bends if you put it in your pocket. Wonder how the pie will do, though. In the past, this sweets shop has whipped up other interesting deserts, including cakes shaped like bowls of ramen noodles.